From Wikipedia, the free encyclopedia Jump to: navigation, search For the similar EX 41 pump-action grenade launcher, see EX 41 grenade launcher. For other uses, see China Lake (disambiguation). China Lake Pump-Action Grenade Launcher Airtronic China Lake 4x40 grenade launcher Type Grenade launcher Place of origin United States Service history In service 1968- Used by See Users Wars Vietnam War Production history Designer Alfred F. Kermode Designed 1967 Manufacturer China Lake Naval Weapons Center, Airtronic USA Produced 1968, 2009- Number built Less than 50, 500 more to be produced from 2009 Specifications Weight 4.63 kg (10.21 lb) loaded 3.72 kg (8.2 lb) empty Length 875 mm (34.4 in) Barrel length 356 mm (14.0 in) -------------------------------------------------------------------------------- Cartridge 40 mm grenade Action Pump-action Rate of fire 15 rounds/min Muzzle velocity 76 m/s (249 ft/s) Effective range 350 m Feed system 3-round tubular magazine Sights Open, leaf-type, square-notch/blade The China Lake Model (or China Lake Pump-Action Grenade Launcher) is a pump-action grenade launcher that was developed by the Special Projects Division of the China Lake Naval Weapons Center, which provided equipment to Navy SEALs. 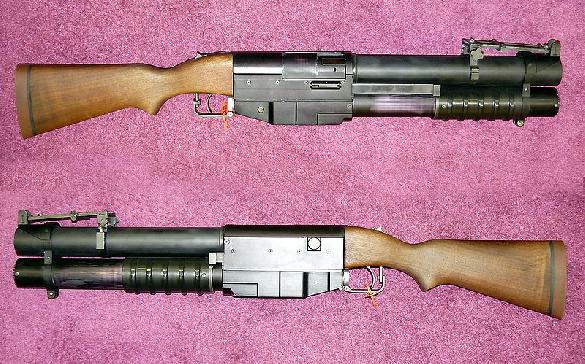 Navy SEALs were unsatisfied with the single-shot nature of the M79 and XM148 grenade launchers, and the repeating T148E1 grenade launcher was unreliable, so they made a request to China Lake engineers. SEAL Teams were pleased with the resultant pump-action grenade launcher, since the tubular magazine held three 40x46mm grenades, and so with one grenade in the chamber, four grenades could rapidly be fired before reloading. In fact a skilled operator could fire four aimed shots before the first one landed. The grenade launcher was extremely light for its size, since a significant portion of it was made of aluminum. The weapon actually weighs 1-1/2 pounds less empty than an empty M79. Loaded with 4 of the 8 ounce rounds, the 4 shot weapon weighs only 1/2 pound more than the single shot M79. Despite this advantage in firepower, it did have limitations as it could not reliably feed the more oddly-shaped 40 mm grenades. The pump-action grenade launcher featured leaf iron sights similar to the M79. The front sight is a fixed square notch. Depending on if the leaf is folded or not, the rear square notch is either fixed or adjustable from 75 to 375 m in 25 m increments. Though meant for the SEAL Teams, a handful were used by Marine Force Recon and Army 5th Special Forces Group. Sources differ as to how many weapons were produced. One claims that between 20 and 30 were made. The highest original receiver number found is 50, but it may never have been made into a functional weapon. However, according to another source, only 16 were made. Since it was made on an ad hoc basis for special operations forces, it was not formally adopted and has no official designation. It is sometimes referred to as the "China Lake NATIC" or mistakenly as the EX-41. The EX-41 was a design concept created in the mid-1980s based upon the earlier China Lake Model Pump 40mm. The EX-41 was produced in prototype form a full 2 decades after the China Lake Model was produced. The China Lake NATIC designation is also erroneous as the weapon was never known by that designation. At least two grenade launchers are on display in museums. One, serial number 4, is at the UDT/ SEAL Museum in Fort Pierce, Florida while the other, serial number 13, is found in the War remnants museum in Vietnam. An effort to produce an improved version of the weapon began in 1992 when Samuel "Dutch" Hillenburg a firearms writer specializing in military weapons teamed up with master machinist, Brian Fauci. In 2003, they achieved a breakthrough and were able to convince fellow writer and firearms enthusiast Captain Monty Mendenhall to finance their research effort. By 2004, they had a functional prototype and began the process of product refinement. Brian Fauci later manufactured for the U.S. commercial market a limited number of such prototypes, calling the Ultimate M79; this weapon has a 4-rounds feeding tube, and is marked Canal Side Guns. The Ultimate M79 is considered a destructive device under US laws and BATFE regulations, and is on sale through Armament Services International Inc. out of Richboro, Pennsylvania. In June 2007, they were in limited production and ready to market the weapon to the military. At that time, they were approached with an offer from Airtronic USA (the current government manufacturer of the M203) to acquire a license for military production and sales. In July 2007, Airtronic USA announced that they were entering large scale production with an initial order for 500 units destined for US military forces. This announcement occurred simultaneously with the taping of an episode of the popular military technology program, "Weaponology". As of 2009, Airtronic USA will commence manufacturing the NATIC launchers in its original form and another variant with picatinny rails, pistol grip and retractable "M4 Carbine" type stock.